Shown above is an Amsterdam world map, made in 1689. Notice that some islands and most of North America are missing. Image by Gerard van Schagen. What is Immappancy? It’s a long word to describe a concept that plagues many – insufficient geographical knowledge. The following conversation might help to explain it. “List the continents in order of size,” I asked an adult family member as I was writing this piece. “Antarctica…that’s bigger than Australia…” continued the conversation. Now do you begin to understand the concept of Immappancy? Kai Krause calls this insufficient geographical knowledge immappancy, and groups it right up there with other issues such as illiteracy and innumeracy. Referring to a random survey of American students, Krause reports that many put the population of the United States at one to two billion, the largest in the world. In addition, the true size of Africa was a particularly extreme worldwide misjudgment. Krause partly blamed it on the highly distorted nature of predominantly used mapping projections such as the Mercator. In reality, you can fit many major world nations into the land mass of Africa. I personally am always perplexed why many refer nebulously to Africa as though it’s a country, when in fact it contains 56 recognized and de facto states. Imagine that you type some place name, say Cape Town, into Google Earth. The first thing you’ll observe will be a small-scale (small features) rotating globe. Then, like a space traveler, you’ll descend to your chosen destination. As the image sharpens you’ll begin to see the large-scale (larger features) details of the site. This allows you to travel seamlessly from a view of a curved surface to that of a flat surface. If you were to take away the details and create symbols to represent the features of the site you’d have a map and you’d think everything was fine. But technically that would not be the case. The development of maps involves mathematics. Over the centuries, mathematicians created various geometrical schemes known as map projections to represent the curved surface of the earth on flat map sheets. All projections have certain advantages and disadvantages and the selection of one or the other depends chiefly on the user’s needs. One way to perceive projections is to imagine a light bulb at the center of the earth projecting the earth’s parallels and meridians on to conical, cylindrical and flat surfaces. The result is map projections with advantages and disadvantages. One such projection, the cylindrical (conformal) projection has its point of contact at the equator (parallels are curved except for the equator.) This preserves shapes and direction while areas and true distances, such as the size of Africa which appears smaller, are distorted. The Mercator is an example of this type of projection. Comparison of the Size of Africa on Mercator (right) and Gall-Peters (left) Map Projections. In light of the above discussion of distortions, we should learn to view a map as critically as a written article. You should know the map projection limits and critically view what you see. Don’t be visually and perceptively fooled on subjects such as the size of Africa, because it affects the way you think, and the way your children think, and their children. It creates immappancy. Krause, Kai. 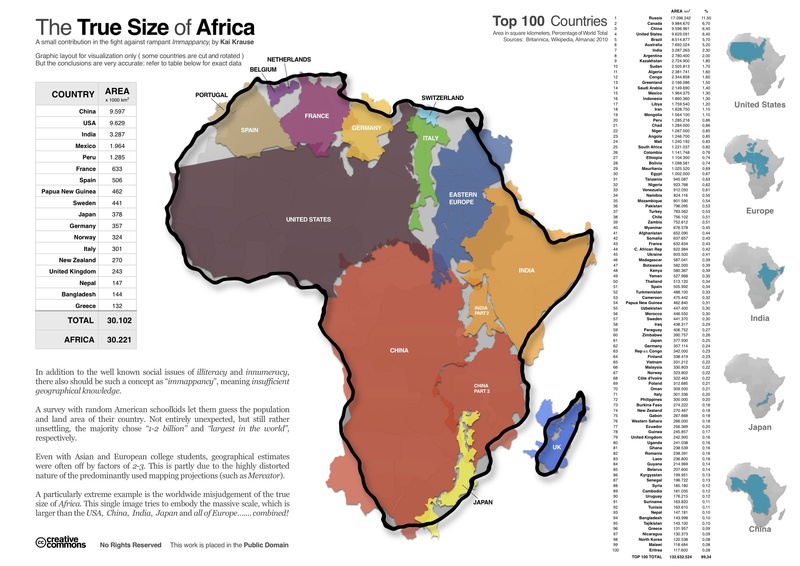 The True Size of Africa. (2013). Marilink.net. Accessed October 31, 2013. National Atlas. Map Projections: From Spherical Earth to Flat Map. (2003). Accessed October 31, 2013.